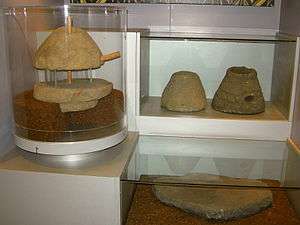 Quern-stones are stone tools for hand-grinding a wide variety of materials. They are used in pairs. The lower, stationary, stone is called a quern, while the upper mobile stone is called a handstone. They were first used in the Neolithic to grind cereals into flour. Quern-stones have been used throughout the world to grind materials, the most important of which was usually grain to make flour for bread-making. They were generally replaced by millstones once mechanised forms of milling appeared, particularly the water mill and the windmill, although animals were also used to operate the millstones. However, in many non-Westernised, non-mechanised cultures they are still manufactured and used regularly and have only been replaced in many parts of the world in the last century or so. As well as grain, ethnographic evidence and Mesopotamian texts shows that a wide range of foodstuffs and inorganic materials were processed using stone querns or mortars, including nuts, seeds, fruit, vegetables, herbs, spices, meat, bark, pigments, temper and clay. Moreover, one study analysing quern-stones noted that a number of querns had traces of arsenic and bismuth, unlike their source rocks, and had levels of antimony which were ten times higher than those of the rocks. The authors concluded that this was probably due to the use of these querns in the preparation of medicines, cosmetics, dyes or even in the manufacture of alloys. The earliest forms of quern were the saddle and trough querns. 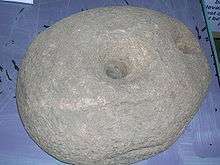 The earliest quern so far discovered dates to c. 9,000 BCE and was found at Abu Hureyra, Syria. A later development was the rotary quern, which takes several forms. The saddle quern is produced by rocking or rolling the handstone using parallel motions (i.e., pushing and pulling the handstone), which forms a shape looking like a saddle. 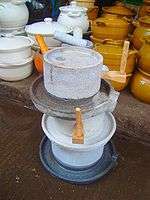 These are the most ancient and widely used type of quern-stone. The handstones for saddle querns are generally either roughly cylindrical (not unlike a rolling pin) and used with both hands, or rough hemispheres and used with one hand. This provides a crushing motion, not a grinding action and is more suitable for crushing malted grain. It is not easy to produce flour from a saddle quern with unmalted grain. The handstone is also referred to as a 'rubber' or 'mouler'. Three beehive querns found in Ireland have inscribed ornament of La Tène type. A quern was discovered at Dunadd in Scotland which has a cross carved into the upper stone. The cross has expanded terminals and ultimately derives its form from Roman and Byzantine predecessors of the fifth and sixth centuries. This example has a high quality of finishing which reflects its 'cost' and enhances its symbolic value and social significance. The cross is likely to have 'protected' the corn and the resultant flour from evil, such as fungal rust or ergot. Various legends give miraculous power to mill-stones and several have been found which have been re-used in the construction of burial cists or as tomb stones. The association between quern stones and burial may be because they are used in the process of making bread, the staple of life. A broken or disused quern therefore can be seen as symbolic of death. In Clonmacnoise, near Athlone in County Offaly in Ireland, a quern stone was found which had been made into a tombstone, having been ornamented and the name Sechnasach, who died in 928 AD, inscribed onto it. ↑ Coe, Michael D. (1999). The Maya (Sixth ed.). New York: Thames & Hudson. p. 13. ISBN 0-500-28066-5. ↑ Rutter, Graham (2003). Basaltic-rock procurement systems in the southern Levant. PhD thesis, University of Durham. p. 236. Retrieved 12 March 2014. ↑ MacSween, A & Sharp, M (1989), Prehistoric Scotland. London : B.T.Batsford. ISBN 0-7134-6173-X. p. 17. 1 2 J.T. Koch, An Atlas for Celtic Studies (2007), p. 150. 1 2 Garnett, T. Observations on a Tour through the Highlands and part of the Western Isles of Scotland, particularly Staff and Icolmkill. Pub. T. Cadell. The Strand. P. 155. ↑ E.W. MacKie, The broch cultures of Atlantic Scotland: origins, high noon and decline: part 2: The Middle Iron Age: high noon and decline c.200 BC – AD 550, Oxford Journal of Archaeology, vol. 29, no 1. (2010), pp. 89-117 (100). ↑ Enid Gauldie, The Scottish Miller 1700–1900(John Donald 1981), ISBN 0-85976-067-7. ↑ Querns and millstones Archived September 17, 2008, at the Wayback Machine. ↑ Ewan Campbell, A cross-marked quern from Dunadd and other evidence for relations between Dunass and Iona, Proceedings of the Society of Antiquaries of Scotland, vol. 5, no. 117 (1987), pp. 105 - 117. ↑ Janet and Colin Bord, Mysterious Britain (Garnstone 1973), ISBN 0-85511-180-1. P. 62.